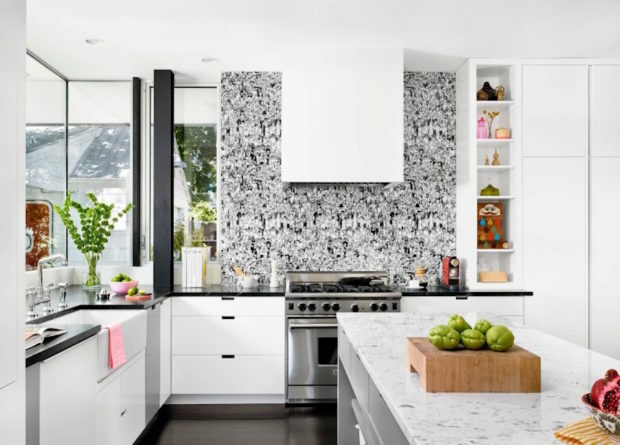 If you want your kitchen to stand out, why don’t you install a wallpaper? This is a quick and inexpensive way to make your kitchen stand out. If you are having trouble choosing the ideal wallpaper, we are giving you some tips. So, read carefully! When you select a wallpaper for your kitchen make sure it’s clean and reliable. Paint and tiles might seem like a practical option, especially when it comes to cleaning. The thing is, most paint brands now offer easy to clean, long-lasting solutions whereas tiles appear as a far better and simpler alternative to keep the kitchen clean. But it doesn’t take much to make a mess in the kitchen. So, you must consider the material you want to use for your kitchen walls. Traditional wallpapers can get dirty, and they end up losing their texture. This is because they are way too thin. Some older wallpapers absorb some unpleasant odors. So, you must stay away from any over textured or fabric variety. Try wipeable alternatives. Some brands are even offering washable kitchen wallpapers. Use these wallpapers because you can easily wipe them clean with damp cloth. You can even use a mild cleaning product of your choice. Just pay attention to the cleaning instructions of the manufacturer. There are three main types of wallpaper recommended for the kitchen. These three types are vinyl, Novamura, and Washable. Vinyl Wallpapers are paper-backed with some colors and patterns printed on a vinyl surface. Vinyl is a chemical made from ethylene. This is derived from natural gas. These wallpapers are hard, washable and they don’t easily fade away, especially when put under direct sunlight. The only issue is, they are hard to strip as vinyl is impervious to water. Washable wallpapers better not be confused with vinyl wallpapers. Washable wallpapers come with a thin plastic coating which covers the pattern printed on the base. This coating makes the paper resistant to stains, and marks which can be cleaned with just wiping a moist cloth. Women emphasize more on the look of their kitchen then its function or practicality. This stays the same when it comes to kitchen wallpaper. The plethora of options available today has made this even more difficult. Some wallpapers come with simple designs and patterns. However, some are a burst of energy. It depends on what you want for your kitchen! You can choose between something simple yet warm or something colorful and dynamic which will brighten the whole atmosphere for you. Despite the current trends, the color and pattern a wallpaper. If you want something to blend easily with your kitchen, then find something intricate. Neutral colors with simple patterns can set in comfortably with any kitchen settings. Select something that will go with the current cabinetry, countertops and hardware colors. It’s important you choose something that complements your kitchen’s current look. If you want to find something elegant, visit wallpaperfromthe70s.com.